Why would I need self storage in Winter Park, FL? There are a variety of reasons why you might need self-storage in Winter Park, FL. How much is a storage unit in Winter Park, FL? The cheapest storage unit in Winter Park, FL is $24.00 per month. What size storage units do you have available in Winter Park, FL? In Winter Park, FL we have sizes that range from 3'x5' to 10'x40' to suit your storage needs. How much is it for a 3'x5' storage unit in Winter Park, FL? The cheapest 3'x5' storage unit in Winter Park, FL is $24.00 per month. A major suburb of Orlando, Winter Park is located on the northeast side of the metro area. The city boasts top-rated education, a diverse culture and acres of beautiful parkland. Just a quick drive from Orlando, Winter Park offers easy access to the big city while maintaining all the charm of a small town. Although the land where Winter Park now sits was home to Native Americans for many years, the community as it's known today did not get its start until the 1880s. The arrival of the railroad contributed to the area's growth in its early years, making it easy for people from all over the eastern United States to visit the region. When real estate broker Loring Chase moved to the area to recover from lung disease, he fell in love with his scenic surroundings. As he explored the area, he found a small grouping of lakes east of the railroad. Working with Oliver E. Chapman, he purchased the land and developed his plan for the town of Winter Park. It took four years to make his vision come to life, which included constructing a town hall, planting orange groves and adhering to a strict set of style and architectural standards. The town gained a post office and a railroad depot, and Chase and Chapman set about advertising their new community. In the mid-1880s, the Winter Park Co. purchased the town, causing land prices to increase dramatically. When Rollins College, Florida's first four-year college, opened in Winter Park, the city continued to gain state-wide attention. A luxurious resort opened the following year, featuring exciting luxuries like steam heating and gas lights. 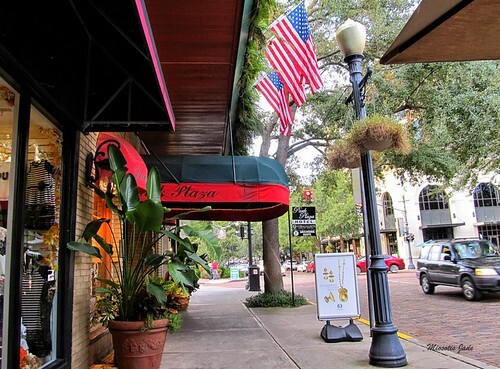 Winter Park quickly became a popular destination for wealthy winter visitors, including several U.S. presidents and celebrities like Frank Sinatra and Hugh Hefner. Winter Park incorporated as a city in 1925, and it's continued to grow in size thanks to annexation. In Winter Park and the greater Orlando metro area, you'll have hundreds of businesses to choose from when you're looking for a job. Flourishing industries in the area include leisure and hospitality, health care, aerospace and business services. Many Winter Park locals choose to commute to Orlando for work because there are so many large companies offering jobs there. Entertainment complexes Walt Disney World Resort, Universal Orlando, SeaWorld Parks & Entertainment and Marriott International are the metro area's largest leisure and hospitality employers. If you're looking for a job in health care, major employers include Florida Hospital and Orlando Health. Lockheed Martin and Siemens are the area's largest aerospace employers, providing a number of specialized positions. Orange County Public Schools manages the public schools of Winter Park, and there are also several private campuses in the city. Winter Park is home to several colleges and universities, including Rollins College, Winter Park Tech, Full Sail University and local campuses of Valencia and Fortis Colleges. Utilities: The city of Winter Park oversees all residential utilities, including electricity, water and sewer services. Garbage and Recycling: Residential trash is collected twice per week, while recyclables are picked up once weekly. Transportation: Winter Park is served by the Lynx transit system, which provides several routes through the town and into neighboring cities. If you're looking for the most affordable homes in Winter Park, focus your search along the city's eastern perimeter and the west side near Lake Killarney. If budget isn't an issue, you can find larger, more luxurious homes in the center of the city, near the Winter Park Country Club, Lake Mizell, Lake Osceola and Lake Maitland. Our lowest priced units in Winter Park, FL average $54.46 per month. 527 people have reserved units in Winter Park, FL in the past 30 days. There are 13 locations within Winter Park, FL's city limits. There are 11 locations in Winter Park, FL that offer AC and Heating features.